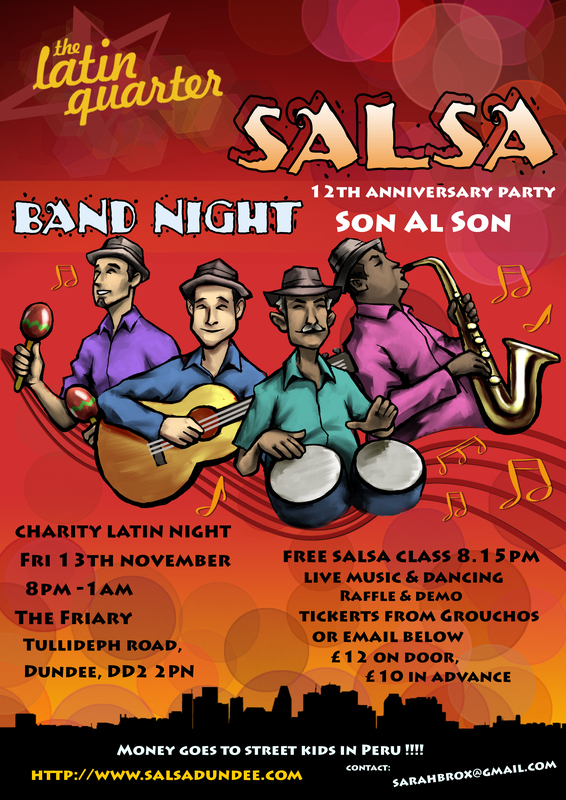 12th Anniversary party : LATIN QUARTER CHARITY BAND NIGHT with the groovy live band SON al SON @ The Friary, Tullideph Rd, Dundee, DD2 2PN on Fri 13th Nov. 8pm-TBC (hoping for 1am). Free Salsa beginners class at 8.15pm. Tickets £12 on door or £2 DISCOUNT in advance from Grouchos, sarah at classes or via sarahbrox@gmail.com. Will be a raffle on the night. Tables can be reserved via same email for 8 minimum for prepaid ticket holders. Details also on www.salsadundee.com. Anyone welcome. Will be bar. All money raised for the Azul Wasi project in Peru near Cusco, home for former street children.